Based on real events and Directed by Paul Greengrass, I would like to watch the film Captain Phillips which is soon out on DVD. 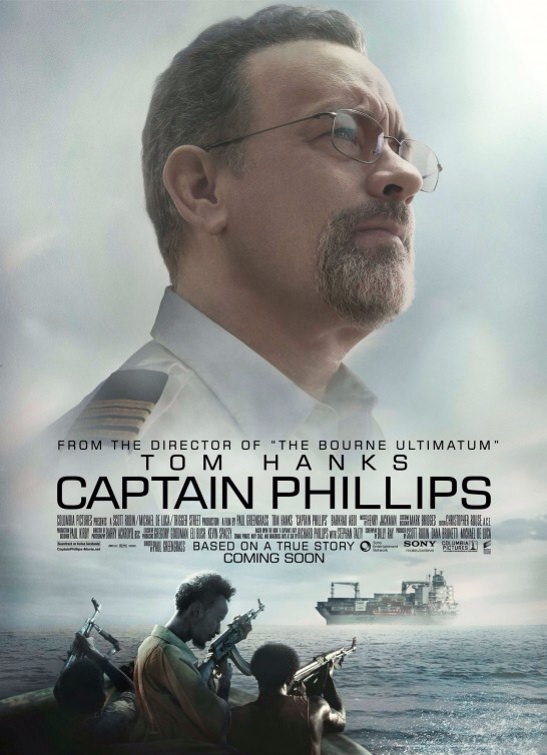 IT stars Tom Hanks as Richard Phillips who takes command of the MV Maersk Alabama, an unarmed dcontainer ship from Port of Salalah in Oman, with orders to sail through the Gulf of Adento Mombasa, round the Horn of Africa. Wary of pirate activity off the coast of Somalia, the captain orders strict security precautions on the vessel and carries out practice drills. During a drill, the vessel is chased by Somali pirates in two skiffs; Phillips succeeds in outrunning them when one gives up after hearing Phillips on the radio calling for immediate military air support (a bluff) and the other loses engine power while trying to gain speed under the rough water Captain Phillips created. The next day one of the skiffs returns with four heavily armed pirates led by Abduwali Muse (Barkhad Abdi); they are carrying a ladder they had hastily welded the night before. Despite the best efforts of Phillips and his crew, the pirates board and take control of the Maersk Alabama, capturing Captain Phillips after he cuts the ship’s engine power and tells the crew to hide in the ship’s engine room. Phillips offers Muse the contents of the ship’s safe ($30,000), but under orders from his boss (the local Somali faction leader) Muse’s plan is to ransom the ship and crew in exchange for millions of dollars of insurance money from the shipping company. A crew member manages to cut the ship’s emergency power, plunging the lower decks into darkness. As Muse, the pirate captain, attempts to search the engine room, the crew members overpower him. Negotiating with the other three pirates, one with badly injured feet, the crewmen arrange to trade Phillips for Muse and the ship’s lifeboat. The pirates force Phillips onto the lifeboat and launch it, intending to hold the captain for ransom. As the lifeboat heads for the shore, tensions flare between the pirates as they run low on the stimulant herb khat, lose contact with their mother ship, and are later intercepted by the U.S. Navy destroyer USS Bainbridge. Once additional U.S. Navy ships arrive, Phillips attempts to negotiate with Muse, who asserts that he has come too far and will not surrender. In the meantime, theBainbridge’s captain Frank Castellano (Yul Vazquez) is ordered to prevent the pirates from reaching the mainland by whatever means necessary. Tim Booth, the lead singer with the band James was born 4th February 1960. James were formed in 1982 in Whalley Range, Manchester, when Paul Gilbertson persuaded his friend Jim Glennie to buy a bass guitar and form a band with him. the band renamed themselves James in August 1982. A gig at The Haçienda caught the attention of Tony Wilson of Factory Records. He offered James an album deal with Factory, but the band, by now a settled live act, were worried about tarnishing their material in the studio and settled instead for a three-track EP. Their debut release, the Jimone EP, The band’s second EP, James II, was released over a year after the first album. Their third release, the Sit Down EP (no relation to the song of that name) came out in February 1986, and was followed by their debut album, Stutter in July of that year. the band recorded their second album, Strip-mine, with a more conventional song structure sadly the album almost went unreleased, but after undergoing a slight remix to sound more radio-friendly,it was released in September 1988. In 1989 James greatly expanded their lineup and sound palette by hiring three new members — guitarist-violinist-percussionist Saul Davies (whom Gott recruited from an amateur blues night), keyboard player Mark Hunter and onetime Diagram Brothers/Pale Fountains trumpeter/percussionist Andy Diagram (the latter a noted avant-garde musician). This new seven-piece line-up went into the studio to record the third James album. Gold Mother which was released IN 1990 which contained the songs SIT DOWN and COME HOME and coincided with the’Madchester’ movement, with its wave of popular Manchester-based indie bands, This focused public attention on James and won them mainstream recognition.More Singles including “How Was It for You”, the remixed “Come Home” and “Lose Control” soon followed. The band’s newfound success was re-affirmed when they played two sell-out dates at the Manchester G-Mex at the end of the year. In March 1991, when the popularity of “Sit Down” led to a re-recorded version being released as a single, Gold Mother was re-released to include “Sit Down” and previous single “Lose Control”, and the album sold ten times more copies than Travis originally predicted. The song became one of the biggest-selling singles of the year. The band members spent the rest of the year recording their next album, Seven, which was released in February 1992. In 1993 James were invited on an acoustic tour of the US supporting Neil Young at a series of natural outdoor venues in the autumn. They returned to England refreshed and ready to record their new album with Brian Eno.The process resulted in not one but two albums: the ‘song’ album, Laid, which was released in 1993, and the experimental Wah Wah, which showcased the band’s improvised jams recorded on the spot, then mixed by Eno. Although The recording of the follow-up album was dogged by difficulties from the start The new James album, Whiplash, followed in February 1997 & proved a successful comeback, reaching the UK top 10 as did the single “She’s a Star”.. The band then returned to the studio to begin work on their next album, Millionaires, which was released in October 1999 but did not reach the phenomenal sales level predicted. After the disappointing performance of Millionaires the band chose to start anew in their approach to their next album, working with Eno once again. They spent most of 2000 recording the album; writing the songs, then performing them live before actually recording them. They embarked on a small-scale tour in the autumn of that year on which their setlists consisted almost entirely of new material. The resulting album, Pleased To Meet You, was released in July 2001. Shortly after its release, Tim Booth announced he was leaving the band to concentrate on other projects of his own. They played a farewell tour of the UK at the end of the year. Their final hometown gig, at the Manchester Evening News arena on 7 December, was recorded for a live CD and DVD, Getting Away With It… Live. In January 2007, music magazine Filter cited an announcement on singer Tim Booth’s personal website, saying that “Tim will be rejoining James in early 2007 for a series of live shows to be announced very soon. due to high demand The initial five dates of the tour were expanded to seven The tour took place during late April 2007, and was followed later in the year by more live shows, including festival appearances at T in the Park and V Festival. The band also appeared at Summercase, Barcelona’s top music concert in Spain during July 2007.April 2008 saw the release of a new compilation album, Fresh as a Daisy — The Singles, accompanied by a DVD compilation of all the band’s promo videos a new album Hey Ma was also released on 7 April 2008. An arena tour of the UK called “We Are Sound” followed in December, on which two new songs (“Porcupine” and “Look Away”) were previewed. The band announced plans to release two mini-albums by April 2010 – The Night Before and The Morning After.August 2010. Following the release of The Night Before, the band embarked on a UK tour, the Mirrorball Tour.At the beginning of 2011, Tim Booth announced that he was working on some new solo material, although James remained active, participating in the Lollapalooza festival in Chile. The band appeared at Hard Rock Calling 2011 and were joined by Kaiser Chiefs and headline act The Killers. The band joined again for a UK wide tour in 2011 with The Orchestra of The Swan and the Manchester Consort choir, The band appeared at the Coachella Valley Music and Arts Festival on 13 and 20 April in Indio, California. The band Headlined Kendal Calling 2012 and also anounced a 10 Date UK Tour starting 12th April 2013. I am a big fan of the artwork of Swiss surrealist painter, sculptor and set designer Hans Rudolf “Ruedi” Giger who was born 5 February 1940. He was part of the special effects team that won anAcademy Award for Best Achievement for Visual Effects for their design work on the filmAlien.He was named to the Science Fiction and Fantasy Hall of Fame in 2013.Giger was born in 1940 in Chur, capital city of Graubünden, the largest and easternmostSwiss canton. His father, a chemist, viewed art as a “breadless profession” and strongly encouraged him to enter pharmaceutics, Giger recalls. Yet he moved in 1962 to Zürich, where he studied Architecture and industrial design at the School of Applied Arts until 1970.Giger had a relationship with Swiss actress Li Tobler until she committed suicide in 1975. He married Mia Bonzanigo in 1979; they separated a year and a half later.Giger’s style and thematic execution have been influential. His design for the Alien was inspired by his painting Necronom IV and earned him an Oscar in 1980. His books of paintings, particularly Necronomicon and Necronomicon II (1985) and the frequent appearance of his art in Omni magazine continued his rise to international prominence. Giger is also well known for artwork on several music recording albums.In 1998 Giger acquired the Château St. Germain in Gruyères, Switzerland, and it now houses the H. R. Giger Museum, a permanent repository of his work. Giger has created furniture designs, particularly the Harkonnen Capo Chair for a movie of the novel Dune that was to be directed by Alejandro Jodorowsky. Many years later, David Lynch directed the film, using only rough concepts by Giger. Giger had wished to work with Lynch, as he states in one of his books that Lynch’s film Eraserhead was closer than even Giger’s own films to realizing his vision.Giger has applied his biomechanical style to interior design. One “Giger Bar” sprang up inTokyo, Sadly though Within a few years, the establishment was out of business. two more Giger Bars in his native Switzerland (in Gruyères and Chur), were built under Giger’s close personal supervision and reflect his original concepts for them accurately. At The Limelight in Manhattan, Giger’s artwork was licensed to decorate the VIP room, the uppermost chapel of the landmarked church, but it was never intended to be a permanent installation and As of 2009 only the two authentic Swiss Giger Bars remain. His art has greatly influenced tattooists and fetishists worldwide. Under a licensing deal Ibanez guitars released an H. R. Giger signature series: the Ibanez ICHRG2, an Ibanez Iceman, features “NY City VI”, the Ibanez RGTHRG1 has “NY City XI” printed on it, the S Series SHRG1Z has a metal-coated engraving of “Biomechanical Matrix” on it, and a 4-string SRX bass, SRXHRG1, has “N.Y. City X” on it.Giger is often referred to in pop culture, especially in science fiction and cyberpunk. William Gibson (who wrote an early script forAlien 3) seems particularly fascinated: a minor character in Virtual Light, Lowell, is described as having New York XXIV tattooedacross his back, and in Idoru a secondary character, Yamazaki, describes the buildings of nanotech Japan as Giger-esque. With a career spanning more than four decades, American rock singer, songwriter and musician Alice Cooper (A.K.A Vincent Furnier) was born on this day 4th February in 1948. He was originally in a band which featured him on vocals and harmonica, Glen Buxton on lead guitar , Michael Bruce on rhythm guitar, Dennis Dunaway on bass guitar and Neal Smith onDrums. The original Alice Cooper band broke into the international music mainstream with the 1971 hit “I’m Eighteen” from the album Love It to Death, which was followed by the even bigger single “School’s Out” in 1972. The band reached their commercial peak with the 1973 album Billion Dollar Babies.